I got engaged this weekend and am concerned about damaging the ring using standard jewelry cleaning methods. First of all, congratulations on your engagement. 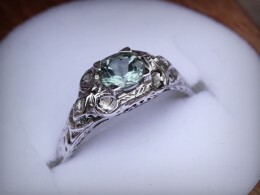 If it is an antique ring, then I would suggest that you don't take the risk of cleaning it at home as it can get damaged. Take it to an Expert Jeweler to get it cleaned and polished. I would say Tarnex but since it's an antique I don't want you to ruin it! Maybe call your local jewler and ask them if it would be safe. Jewelers today clean by steaming or by ultrasonic cleaners (sound waves only), depending on type of metal, its thinness and age. If you are truly concerned ask the pros. An old ring might also have loose or worn prongs that only a jeweler can repair. Don't rub the antique ring with a paste. To get it clean at home use Windex and an old toothbrush. To me....if it is Antique & you want it that way just lightly brush it to clean the dust away. If you polish it, it will look new & lost it antiquity. If you want an at-home remedy, try using a little bit of toothpaste and gently clean with a small jewelry cleaning brush often found included with jewelry cleaning solutions or buy a soft silver cleaning cloth. My mother in law is a hygienist and they sometimes put rings in their ultrasonic cleaner and it comes out sparkling! Ask at your dentist the next time you go and they will probably do it for free but I can't say if it would be smart for an antique ring. Never use toothpaste on silver or gold...toothpaste will scratch it. The same is true for using toothbrushes. The advice to let a pro clean it is the best thing to do. If you ruin a ring like this, it's gone. don't use ultrasonic until you know the nature of the centre stone, you risk damaging it. in the short term, warm soapy water and a soft toothbrush should be fine. I have a rare antique ring that I know no history of. I am not sure if it is gold or silver, it...as three diamonds on top and a loose hanging cross and two seed pearls on each side. Is there any way you can help me with the history or value?